You know those moments when, if there was a “bad parent of the year” trophy, you’re certain you would have won? Yeah, we all have had those. I remember one of them quite well. It was early morning and I was making one of my world famous breakfasts, also known as a toaster pastry from a box, when I noticed my daughter looking a little sad. I asked her if there was something wrong and, after a long pause, she said that there was. “I had a bad dream last night,” she said. Is there anything lonelier than having your pain go completely unnoticed? The people of Israel were suffering greatly under Egyptian oppression. They cried out in their pain and distress. And He heard them. You have a God who hears you when you cry out in the middle of the night. He is passionate about you and will never sit idly by when you are hurting. Are you carrying a load that seems unbearable? Listen to the promises of the Lord. I will bring you out from under the burdens of the Egyptians. (Exodus 6:6 ESV) God will bring you out from under the burden you currently carry. You are not stuck. Keep trusting. Keep following. Step by step, He will bring you out. I will deliver you from slavery… (Exodus 6:6 ESV) God is all about freedom for His people. It is His heart’s desire for you to be free from fear, insecurity, doubt and even death itself. In Psalm 32:7, David declares, “You (Lord) are my hiding place; you will protect me from trouble and surround me with songs of deliverance (NIV.) Whatever it is that currently has you bound, He wants to set you free from it and He wants to do it today. I will redeem you with an outstretched arm and with great acts of judgement. (Exodus 6:6 ESV) God promises redemption. This world is broken and sin-stained. It can be a lonely and painful place at times. Heartache may rock your world and it may seem as if nothing good can come of it. The Lord can redeem it. He can work any situation for your good and for His glory. He loves you too much to let your pain be in vain. There are days, weeks even, when it is all you can do to function. Life has gotten you down and continued to kick you. I understand. If we could sit down over coffee, I would share with you all the trials God has seen fit to allow me to walk through. Some of them, I have not yet made it to the other side. So, do not think that this is just a devotional written by someone wearing rose-colored glasses who doesn’t know how hard life can be. Fellow pilgrim, I know. Like you, I have been in seasons when I could not hear God’s voice. Scripture says that, after God gave these promises to Moses, Moses went and told them to the people. Guess what! God is going to lift your burden. He is going to deliver you and redeem you. How awesome is that? Do you want to know their response? They did not even listen to Moses. They just did not want to hear it. Why? Can you relate? I know you can. Your spirit is crushed. The burden seems harsh that you carry. So, what’s the answer? Long before the trial comes, you have to know what your Father has promised to you. What you learn on the mountaintop will carry you through the valley. Spend time with Him. Listen to Him. Know His Word. Then, when that hard time comes, you’ll know. When you can not seem to hear Him, you go with what you know. God is more than a promise-maker. He is the great promise-keeper. And, when He promises deliverance, you will be delivered. He hears you, friend. When no one else does, He hears. This post is part of a 31 Day series. Read the first post here. Hey, since you’re here, why not hop over to the Family Matters blog and read my 30 ways you can Bless Your Marriage today! 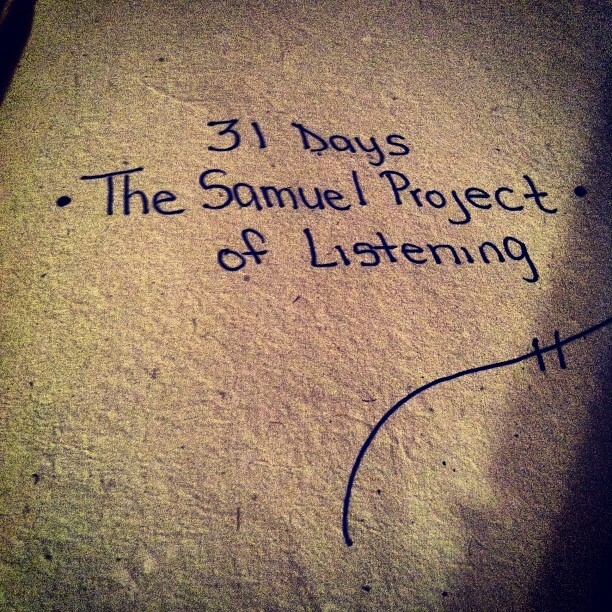 Another great 31 days post! I can relate to the Israelites when they didn’t believe what Moses told them God said about their deliverance. When it seems as though God hasn’t been listening for a while, it’s hard to believe He’ll rescue you. But He will!